Reggie is a turkey who doesn’t fit in with the flock. Free Birds does not really take the time to establish precisely why this is, but then it doesn’t take the time for much of anything at any given moment. It’s a computer-animated children’s feature of second-rate quality, so it’s fast-paced, desperately eager to please and generally lacking in depth, but Free Birds seems to be in more of a rush than is usual in the genre. The franticness of the affair is meant to be whipsmart and entertaining but it comes across as tiresome and uninspired more often than not. But anyway, back to Reggie (voiced by Owen Wilson). He alone amongst his turkey flock realizes that their apparently blissful existence of eating corn and doing nothing ends up in an oven and then on dinner plates around Thanksgivingtime. But his warnings fall on deaf ears (if turkeys had those, that is; earholes?) and Reggie is ostracized by his peers. Reggie is plucked from his pariah status in the turkey coop when the President of the United States (Jimmy Hayward) grants his hyperactive daughter (Kaitlyn Maher) her mercurial wish to free Reggie as the yearly turkey pardon. Nestled into Camp David with a purloined presidential remote control, Reggie becomes a pampered couch potato, ordering a succession of pizzas and binge-watching melodramatic Mexican telenovelas. With relatively witty and quickfire jokes skewering disposable TV, advertising, conformity, and even religious dogma, these establishing scenes are promisingly amusing and are blessed with a fleet comedic rhythm. It does not last. Nor does Reggie’s lone wolf bliss. He’s abducted by a beefy, intrepid, distinctly dim alpha turkey named Jake (Woody Harrelson doing better voicework than this movie deserves). A member of the Turkey Freedom Front (perhaps the only one, a semi-reference to Monty Python’s Life of Brian alongside other, inert 2001 and Raiders of the Lost Ark homages), Jake enlists the reluctant Reggie for a mission to penetrate a secret experimental base, steal into its prized time machine, and travel back in time to the first American Thanksgiving in 1621 to remove turkeys from the holiday feast menu for good and all. Why does the United States have a time machine and how do they intend to use it? We don’t know. Seeing as the “First Thanksgiving” feast shared between Puritan colonists in America and the Native Americans in a spirit of openness and cooperation is a sugarcoated myth, is Free Birds aware that the holiday’s New World origins and turkey-centric traditional foodstuffs likely lie elsewhere? Evidently not. Why are the European colonists armed with 18th to 19th-century weaponry in the 162os? Why do the indigenous turkeys in colonial America possess a definite First Peoples cultural character? Who can say? Historians and Native peoples alike would be offended if they cared enough about this mere trifle to notice it. The attraction of Free Birds lay in its narrative concept, which seemed ripe for a fascinating metaphorical illustration of the disavowed colonialist exploitation central to American history. An outsider figure encounters a besieged indigenous community, targeted as a mere exploitable resource by white European colonist invaders, and helps them defeat those seeking to loot their natural bounty for their own selfish and destructive gain. 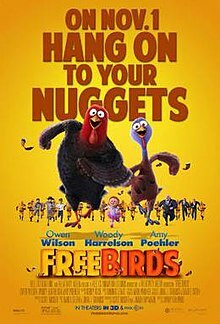 Free Birds half-promises this premise and even half-delivers it, with a fantasy resolution uniting Pilgrims, Indians, and turkeys in a convivial pizza party. But it’s entirely too hectic, unfocused, and lacking in attention span to maintain such a larger metaphorical significance and too insubstantial to support even the fragments of that significance that linger on. Some enlivened frisson percolates on that insubstantial surface. Amy Poehler injects some nice low-key feminism into the mix with Jenny, the daughter of the turkey chief Broadbeak (Keith David). Harrelson’s Jake, as mentioned, is a sometimes-funny goof on alpha male hero figures and engages in a loopy inflated-wattle dust-up for masculine dominance with the chief’s son Ranger (Hayward also). George Takei voices S.T.E.V.E., the time machine’s dignified but mischievous artificial intelligence system, with his peculiar mix of impishness and gravity. And there’s a surprisingly emotive communal mourning ceremony involving feathers and flapping wings in the middle of the silly perpetual motion of the action. But Free Birds doesn’t settle on anything for long enough to stick with the viewer, casual or otherwise. What might have been a subversive cartoon satire of the Thanksgiving myth and its cheery historical whitewash of the decimation of the Native American population instead parrots that whitewash and even extends it to the meat-heavy American diet. A movie that might have crackled with cleverness instead gets caught up in its own chaotic energy and stumbles consistently. Free Birds is occasionally kind of fun, but it could have harnessed that fun to broader purpose and it simply does not.